During the 1800s people moved off the land, which made it difficult for them to get hold of fresh dairy products. Milk that took up to 24 hours to separate and then spent days in transit was a breeding ground for bacteria. So a number of new methods of separation became popular. In 1877 Gustaf de Laval was drinking his after-dinner coffee. 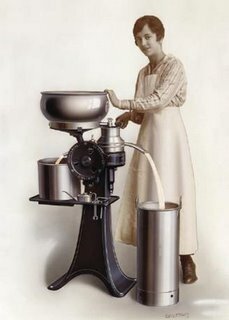 A colleague was sitting with him, reading aloud from a German trade journal describing a new invention that used centrifugal force to separate cream from milk. After listening de Laval took the journal with him when he went to bed. And by breakfast the next day, he had worked out how to improve the concept. By December of 1877, de Laval had succeeded in producing a machine that worked, and he arranged a demonstration. He filled it with nine churns of milk, and rotated it at 800 revolutions per minute. After 15 minutes, the cream was completely separated from the milk. Gustaf de Laval had produced the first continuous flow cream separator. His invention was to revolutionize the dairy industry. His later inventions included milking machines and a nozzle that became a vital component of jet and rocket engines, but the cream separator was so successful that in the early part of the last century his company was selling 4 million of them a year. It was this machine that was adapted by Cohn and others to become the first blood cell separator and is now used universally in blood fractionation by the transfusion service and for stem cell transplants. How interesting! I never would have guessed that, but it makes sense.